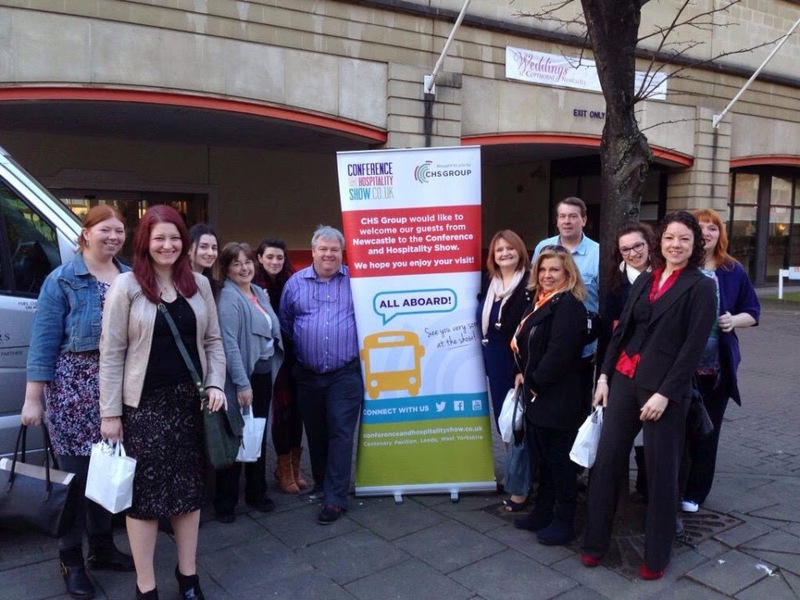 I was delighted when Lizze Adamson-Brown Travel Counsellor invited me to a 'secret group' on facebook entitled CHS 15. Secret groups are always exciting and as I read more I could feel the excitement bubble up inside me. Would I like to attend CHS 15 in Leeds as a VIP where there would be 120 exhibitors from the events and hospitality industry plus seminars, VIP goody bags, networking and lunch included? Of course I would! I marked March 24th in my diary and although I had only met one other person on the trip, I was really looking forward to it. A HUGE thank you to the lovely Wendy from Just Perfect Wedding and Events who kindly offered to drive me to the Copthorne at 7am in the morning - it saved me a fortune in taxi fares! Our coach arrived in Leeds in no time - we collected our VIP passes and goody bags (filled with lovely Elemis products and an afternoon tea voucher amongst other things - fabulous!) and headed inside. Our first stop was the Champney's stand where Kelly (Cygnet Careers) experienced a lovely hand massage whilst I enjoyed a much needed coffee. We then had a good browse around all of the stands and I thoroughly enjoyed chatting to the exhibitors and finding out about their hotels and services. In particular it was lovely to chat to the local-ish ladies from Beamish Hall and listen to Kerry's tips about how bloggers should not approach hotels. I also enjoyed chatting to Jane from Pride of Britain Hotels and hearing about The Swan at Lavenham and their brand new spa plus the team from Visit Scotland were lovely too and had lots to tell us about their fantastic country. Sorry about the quality of my pics - I had so much to carry that there was no way I could take my DLSR so iphone photos will have to do! Everywhere we turned there were goodies galore! We had been walking for a while and decided lunch was in order so we headed over to the VIP hospitality tent (provided by PapaKata) for a much needed sit down and re-group. The tent was gorgeous and lovely and snug with open fires and faux-fur throws. After lunch we were keen to head to the events management stage. It is always inspiring listening to experts in their field and I certainly learned a lot and was provided with some food for thought. 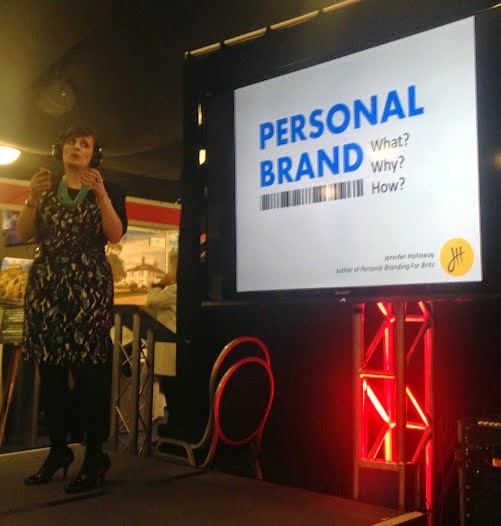 Jennifer Holloway (author of personal branding for Brits) was enthusiastic and shared with us lots of little tips to ensure that when you're not in the room people are saying positive things about you. Jennifer was really inspiring and I've actually purchased her book today after hearing her speak. I was also very interested to hear what Jonny Ross from Jonny Ross Consultancy had to say. SEO is a tricky business and Jonny has inspired me to start looking into vlogging regularly after sharing his thoughts and insights. Youtube is the world's second biggest search engine so for people like me who want to be on the first page of google, it is mad not to use video regularly. Between speakers I decided to enter the CHS 15 selfie competition and quickly took this snap of myself and Kelly with our 'silent disco' headphones on. The show finished on a high with hospitality hour - we were provided with lots of free wine whilst singing and dancing along to Tenors Unlimited. The Barcelona trip prize winner was drawn and I was very pleased to be crowned with 'best visitor selfie of CHS 15' Yeah! The champagne is chilling in our fridge ready for the weekend! 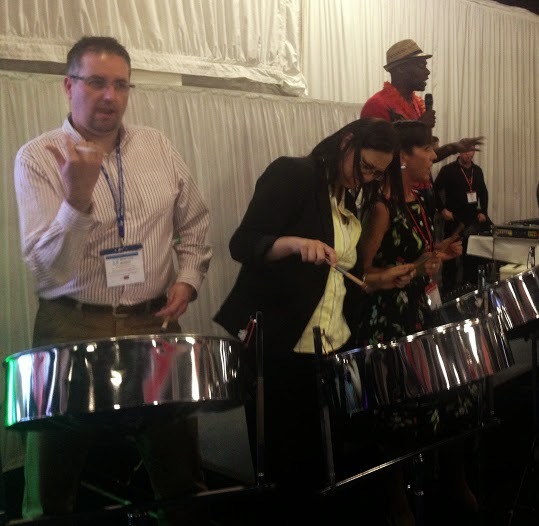 Colin from our group was then encouraged to try his hand at playing the steel drums - I actually thought he did a good job considering they had less than 5 minutes to learn the song! We had lots to chat about on the bus journey home and I really enjoyed learning about Leanne's Tyne and Knot blog and how she markets her dance/fitness school (React Dance and Events). I was sat next to Claire from Social Media Concierge - I thought I knew a lot about social media but my knowledge is not a patch on Claire's! We talked (well she talked - I listened) about google hangouts, youtube and linkedin which was fab! It was also good to talk all things wedding with Claire (Wedding Planner North East) and Wendy (Just Perfect Wedding and Event Gallery). All in all, my day was a huge success! I have made some fantastic contacts (which I now need to follow up), enjoyed some wonderful hospitality, learned a thing or two and definitely had fun! Thanks Lizzie for organising - can't wait for next year! It was such a good day - I really enjoyed it. It's nice to do something a little different I think! This looks like such a fun day and really informative, thank you for sharing. I would love to start going to events like this. It was a wonderful experience - lovely to try something a little different. Well done on your 'Best Selfie' award! We won the award for 'Top Exhibitor Tweeter' from Alton Towers. Glad you enjoyed the show! Congratulations to Alton Towers too - I hope you had a good show. We loved the goodies at your stand and hearing all about your family events. It was a lovely day Emma - can't wait until next year now! Yeah I did - the seminars were very informative. Can't wait for 2016! Looks like such a fun event/day. Those macaroons look amazing.